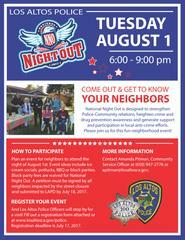 On Tuesday, August 1, 2017, Los Altos Police will be celebrating the 34th Annual National Night Out. This national campaign is designed to raise crime prevention awareness, strengthen neighborhood unity and develop partnerships between Police and the community. Residents are encouraged to participate by turning on their porch lights from 6:00 p.m. to 9:00 p.m. and getting out to meet their neighbors. When residents on a block know each other, the neighborhood and the community is safer and stronger. The number of Los Altos neighborhoods celebrating grows each year; in 2016 we visited 21 neighborhood events and reached nearly 800 people on National Night Out. Many neighborhoods celebrate this event with block parties, pot lucks, barbecues or ice cream socials. Of course, Los Altos Police are more than happy to join the fun!